Six months after the BCA Center opened the Vermont Metro Gallery on the building's fourth floor, it's clear this was a strategic mistake. Rather than situating this venue — and its exhibits — out of sight, BCA should have installed the modestly sized gallery at the Church Street Marketplace level. Gallery curator Kerri Macon has so far staged three strong group shows that together highlight the breadth and depth of artistic talent in Vermont. Each has proved more aesthetically alluring than the recent exhibits given pride of place on the center's ground floor. But casual visitors to the BCA Center — especially those who are unimpressed by the conceptual work typically displayed at street level — may never make it to the top floor, or even know it exists. And that's a pity. Such viewers would be missing out on "Abstract Terrains," a thematic show that extends the Vermont Metro Gallery's winning streak. Three painters and a photographer achieve four-part harmony in this grouping of about 30 pieces in which each artist's eye and hand have transformed a bit of the natural world into something elemental. Personal visions and styles act here to defamiliarize landscapes, causing viewers to see everyday subject matter in new, revealing ways. Retired architect and active painter Tom Cullins manages to make the rock face of the Barre granite quarry appear both recognizable and recondite. 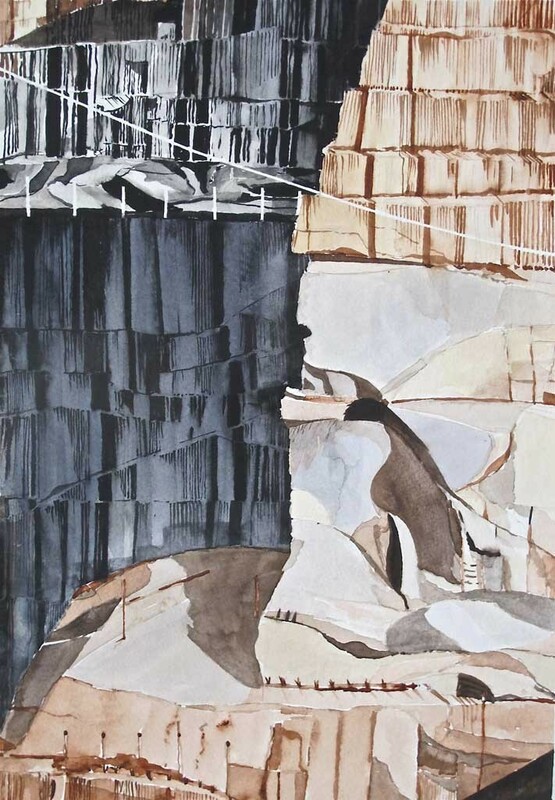 Cullins' suite of 10 identically sized watercolors have been hung close together to produce multiple perspectives on various corners of the quarry, which he seems to have painted at different times of day. The close-up renderings of the sheared planes of granite emphasize their angularity and subtle color contrasts. In most of the pieces, an interplay of shadow and light further enhances Cullins' ability to make us see the pure geometry of his forms. The series serves as a fine contemporary example of the analytic cubism pioneered a century ago by Picasso and Georges Braque. Gary Hall does something similar in the medium of photography. He also takes quarried rocks as the subject of most of his pieces and, like Cullins, produces intriguing visual effects through close-up studies of a small part of a large whole. In "Vein Cut Marble," for example, two white diagonals — one intact, one fragmented — run jaggedly across a backdrop of black vertical lines. This must be an almost-microscopic view of a piece of cut marble, but a viewer sees it as a juxtaposition of straight and angled streaks, as well as an arrangement of gray, white and black. There's a murky quality to these photos that viewers may find off-putting at first. Concentration brings rewards, however, as Hall's compositions slowly reveal their essence. "Quarried Marble" is particularly striking. Eleven stalactites drip delicately downward like spilled liquids along a creased and gnarled surface. These images represent a departure — or perhaps a personal interest — for Hall, whose commercial specialty is photography for architects, builders and the hospitality industry. Admirers of art photography who see his contributions to "Abstract Terrains" will come away hoping he continues in this direction. Viewers probably won't deduce the inspiration for Elizabeth Nelson's three large-scale, checkerboard paintings until the titles tip them off. 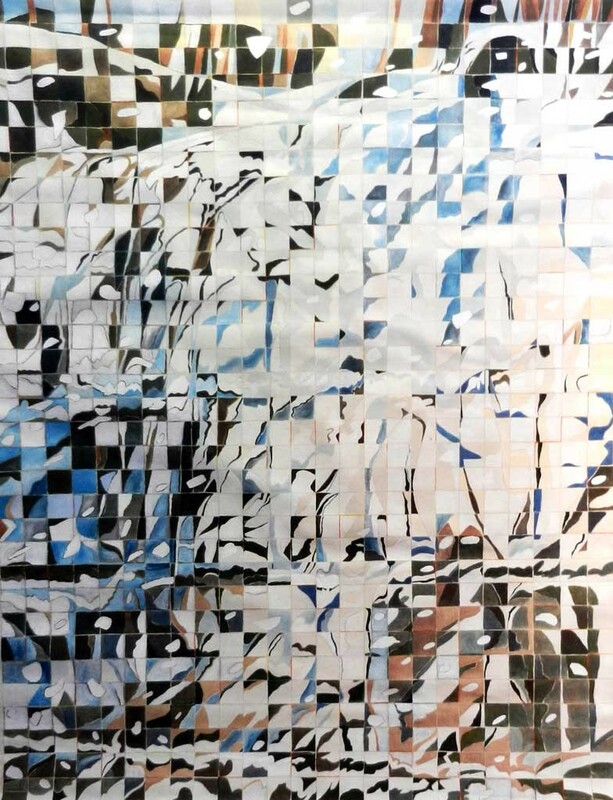 Horizontal and vertical rows of small squares — most of them given a patterned treatment, a few left untouched as sections of canvas — combine into dappled and jutting arrangements of color and form. They can also be read, in keeping with Nelson's obvious intention, as abstract reworkings of representational scenes. Browns and grays are the dominant colors in "Interstate Rocks — March," which includes a narrow swath of sky blue on its top edge. Snowy white and icy blue fill most of the picture plane in "Interstate Rocks — February," although bits of brown and gray pop up in places, just as they might on remnants of ledges seen in winter from a passing car on I-89 or I-91. In "Looking Up," the artist's perspective is that of an observer lying flat on her back and viewing a forest canopy and the clouds above. It's an assemblage of hundreds of squares smaller than those in the two interstate paintings. Nelson has colored many of them a leafy green that intensifies Vermonters' yearnings for spring. These are pointillist works — except they consist of exactly proportioned squares rather than dabs of various shapes and sizes. Johanne Yordan moves further away from realism than do the three other artists in "Abstract Terrains," but the titles of her paintings, like Nelson's, serve to orient us toward their origins. Yordan's paintings have a brooding beauty suggestive of mirages. "Parallels" has a horizon line at its midpoint, with blue and white washes above it. Below are shimmering, upside-down reflections of the black and gold shapes that rise like minarets or radio antennas from that horizontal divide. It's as though tall objects were being viewed at a distance across a watery expanse, although Yordan has given the water a confoundingly beige complexion. "Emerge" is even more mystifying as to its source in the physical world. Here, a cottony clump of white separates a scratched black mass from a grayish upper section of the canvas. Gold dribbles from the painting's center toward its bottom edge. What's the terrain that Yordan has abstracted here? It's hard to say — and there's no reason to go hunting for literalism. As the red dots affixed to many of Yordan's works indicate, the Vermont Metro Gallery appears to be fulfilling its mission of selling art, not just showing it. And that makes this space an even more valuable addition to Burlington's gallery scene.